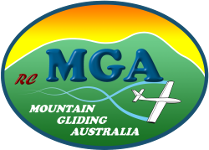 Mountain Gliding Australia (MGA) is set up for model gliding enthusiasts who want to participate in competitive slope gliding, otherwise known as slope soaring. Beginners and casual fliers are also welcome. Click here for our event's calendar. Click here for the MAAA Rules changes. 1. Bass residence for flight simulator instruction. 2. Bass Oval for flat field instruction. 3. Kilcunda for slope soaring instruction (flying along hill tops). If you've already bought a model and damaged it, we might be able to repair it. If you haven't got a glider, don't worry, we'll loan you one. MGA offers interesting and challenging events for glider pilots wanting to participate in slope gliding and for fliers already involved in aeromodelling but who are looking for new challenges. Written documentation accompanied by diagrams and video instruction is also available. Unique to MGA is the use of electric gliders with some restrictions in certain events. It means that cancellations can be minimised and safer flying is assured. We also welcome any form of electric powered aircraft, including multi-rotors. If you haven't flown on the slope you don't know what you're missing. No stiff necks, longer flight times with the one battery and of course that country air. You will however have to be willing to travel long distances and be at ease with the venue or date being changed at a moment's notice. If MGA is what you are looking then join our mailng list.